This is a repeat of a blog that I had written on another site. Ever since I knocked over my cage full of parakeets with the vacuum I was content to see birds in the wild. As the seed scattering, mass pooping and feather flying birds flew out my front door I thought, fly away you ungrateful birds. And I quickly gathered up all the cages, feed and paraphernalia I needed to maintain them and threw them out. I had such a grin on my face. But when it came down to it I missed looking at them and I worried their beaks would overgrow and they would not find food to eat. I do love birds but since that day I was content to see them in the wild. I’ve since maintained that birds are much happier flying from fence to post then from swing to dish. Now you would think living in Hawaii I would see all kinds of exotic birds. But that does not happen. Most have become extinct due to the mongoose eating their eggs or mosquitoes biting and killing them off. Some birds have moved so far back into the mountains you don’t see them at all. 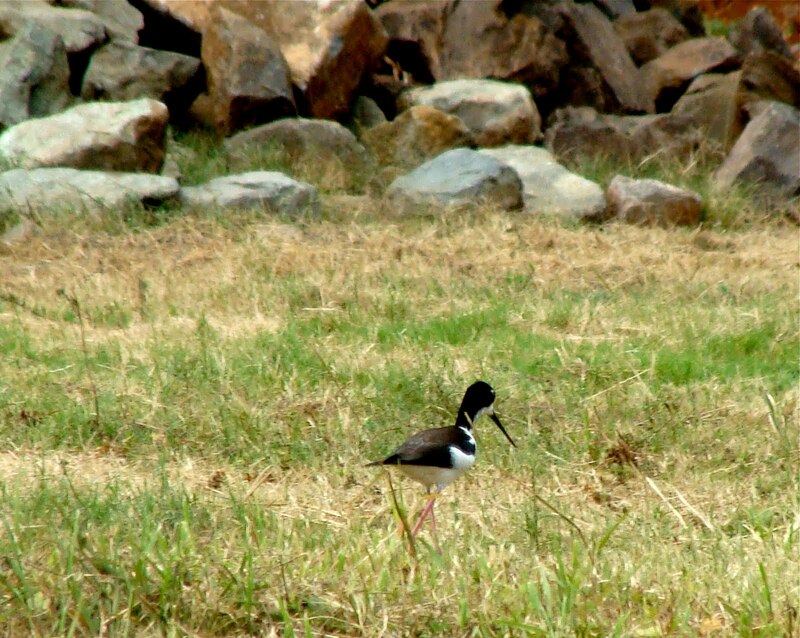 Then there are the introduced birds who have taken over the indigenous birds habitats and it goes on and on. But when I go holo holo I do manage to get some photos of birds. They are not all locals but they are still enchanting none the less. Now this little guy is a Cattle Egret. 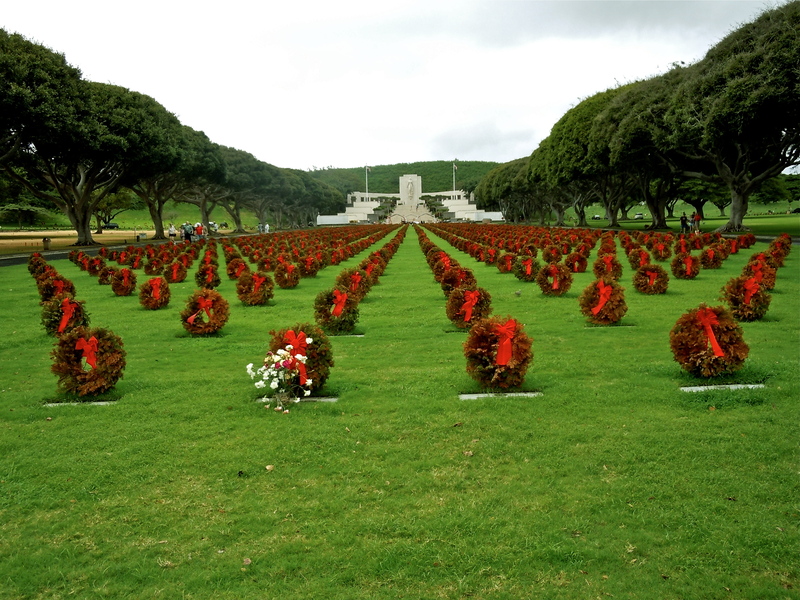 They were Originally brought to Hawaii to help control Cattle pest. You would have very recently seen them following after the laborers as they dug up the soil to plant pineapples. The pineapple fields have shut down and I’m sorry to say Monsanto has moved in. 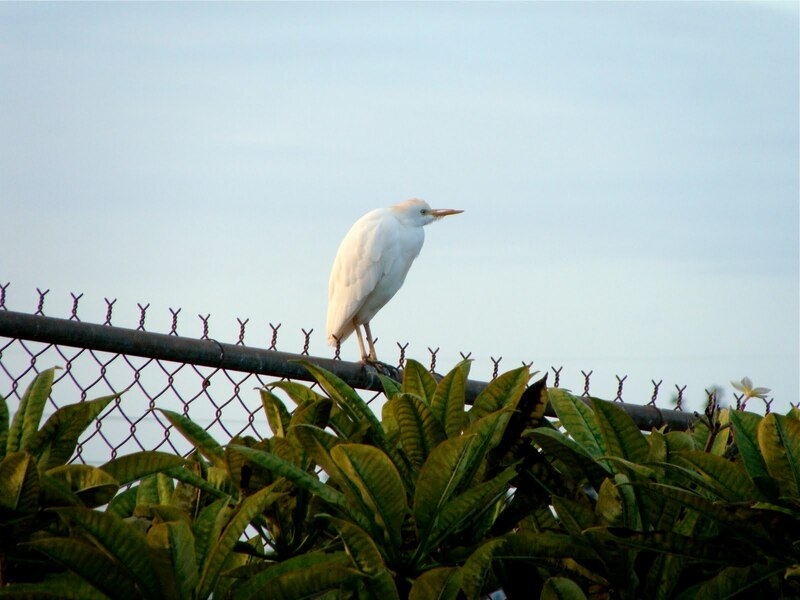 I hope that the egrets don’t die following the workers digging up Monsanto’s Frankenstein creations. I took this photo as the bird sat on the fence counting the children as they passed by to go to their class rooms. I posted this photo extra-large so that you can see the two types of birds in this tree. The brown tinged one with the red by its eye is the Common Wax Bill. I believe he is a member of the finch family. For such a little guy he truly is a piggy. If you set out a feeder of seeds he and his co-hearts will take over the feed, not allowing anyone else a turn at it. In the wild he seems to have better manners and is seen here sharing his bounty with the Java Sparrows. He has the yellow around his eyes and is green tinged. 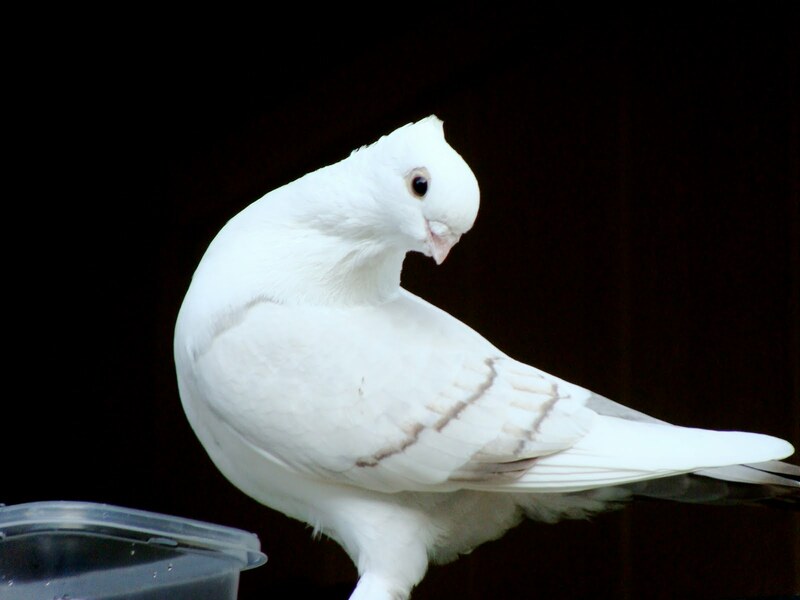 The Java Sparrow originally came from Africa and is quite a shy little guy so you don’t see him around to often. 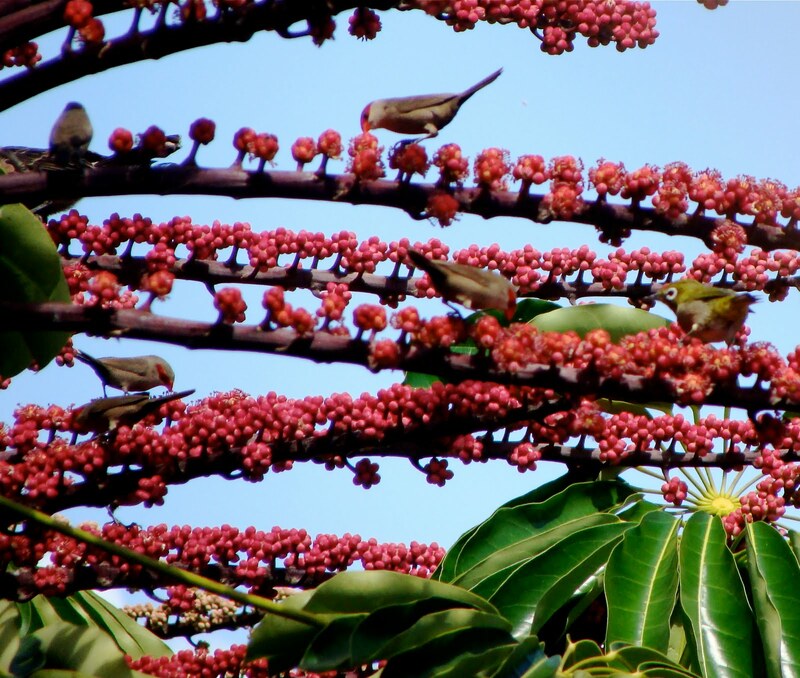 Again I was at my grandson’s school when I saw these birds whacking the seeds off this tree. Visiting the Waipahu Cultural Plantation I saw this bird. 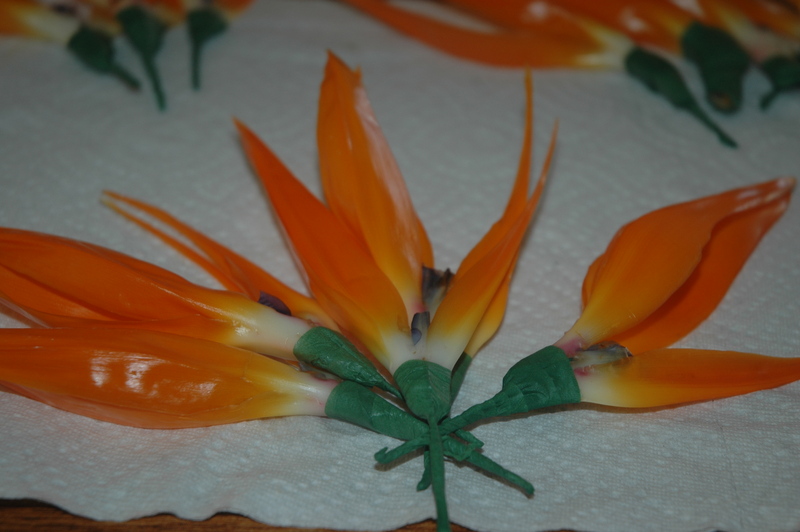 And would you believe it is actually indigenous to these islands and is on the endangered species list. I was so excited to get his photo I almost ended up in the water. Ample taro fields once worked and planted by the ancient Hawaiians supplied this little fellow with lots of habitat. Due to the loss of these taro fields they have very few places to thrive now days. 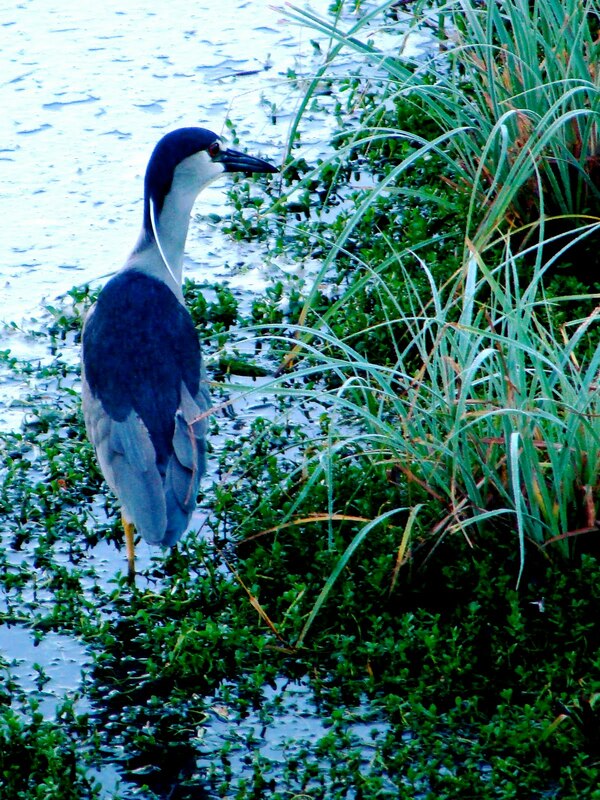 He is the only Native heron in Hawaii but he is not endangered and is common around here. Isn’t this little guy just adorable. Yes he is a special breed of pigeon or he just may be a common one but he so loved my friend. He showed up in my friends yard one day and flew everywhere my friend walked. He even flew out to his truck with him and would sit on his head. Of course my friend said he wanted to get rid of him because he pooped everywhere in the yard. He told me this in a gruff voice as he placed food and water high up on a shed where cats could not reach. I said “if you want to get rid of him why are you feeding him?” My friend got all discombobulated and said “well I can’t let him starve.” Next thing I knew the bird was sitting in the house on my friend’s shoulder while he cooked. And then I found that I did not have to go far to find birds when I found this little guy. 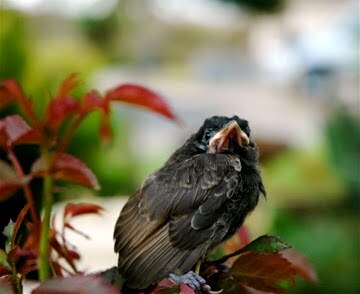 It was spring time and I do believe he was trying to learn to fly and landed on my roses to catch his breath. I saw him when I walked out of the house. He is a baby mynah and they are as common as a cold. His mother, I think, was the one that would bombard my Zoe when ever she came outside to walk with me. The mother myna would fly out of the tree and swoop down on poor Zoe as she walked along. She never knew why as she was not even looking for birds. 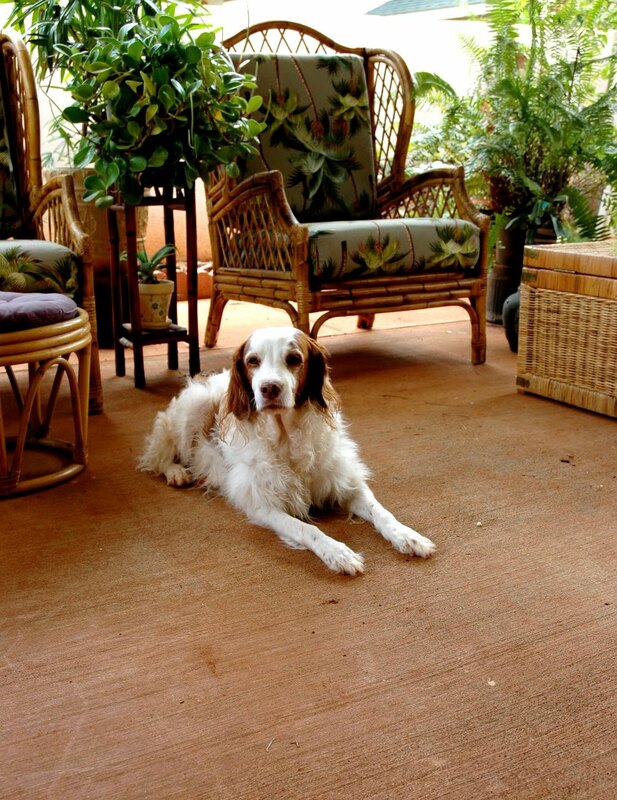 I think the mother myna must have know that Zoe was a Brittany Spaniel and they are bird dogs. All kinds of birds have come into my life since that day the cage fell over but there will never be another bird like my Zoe. Rest in peace my little Bird dog. 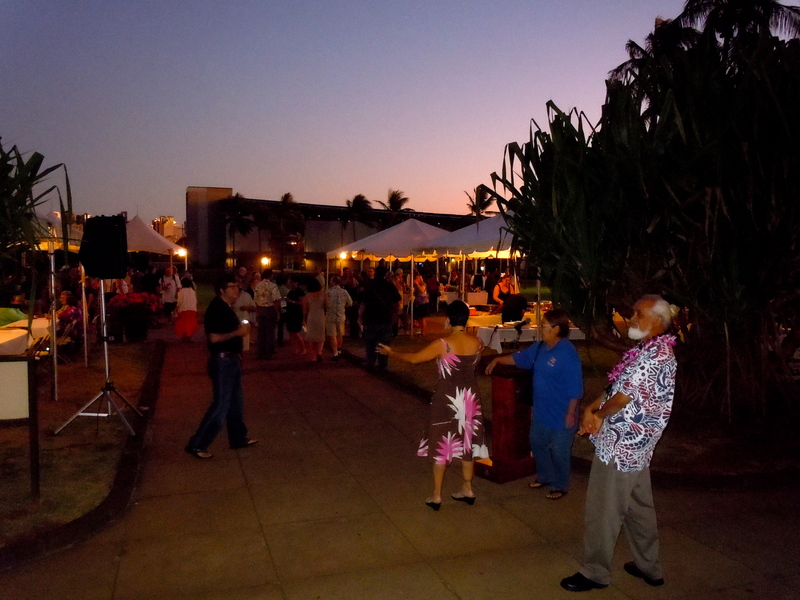 The Bishop Museum had a luau last night for The Western Museum Association (WMA) and a wonderful night it was. 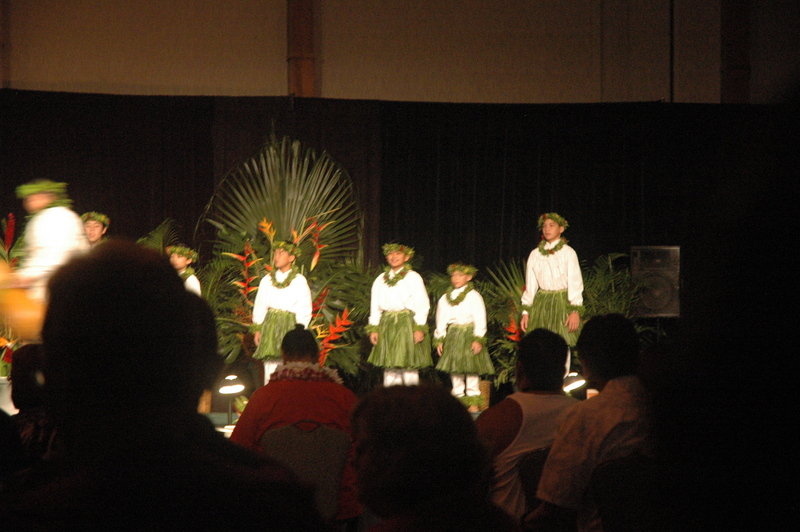 One of the charter schools presented the children to give a welcoming oli in Hawaiian. 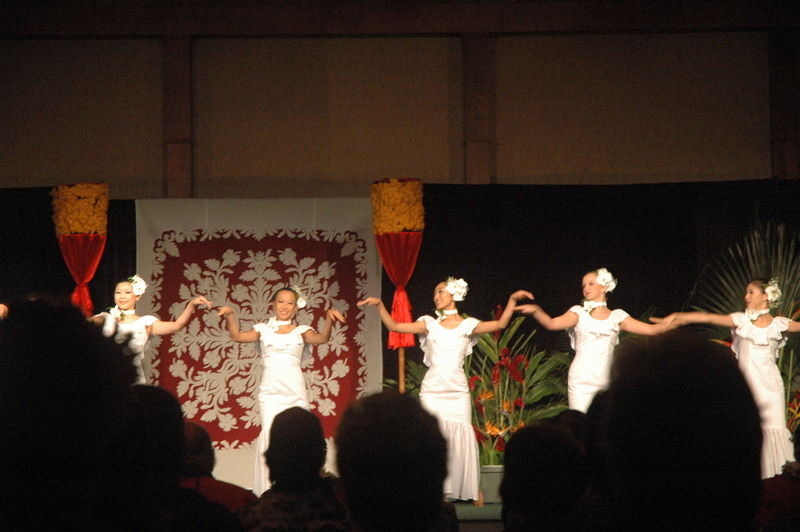 If you double-click on the photo and look to the left you will see a number of lei on a poll which the children then took and gave out to the conference participants. 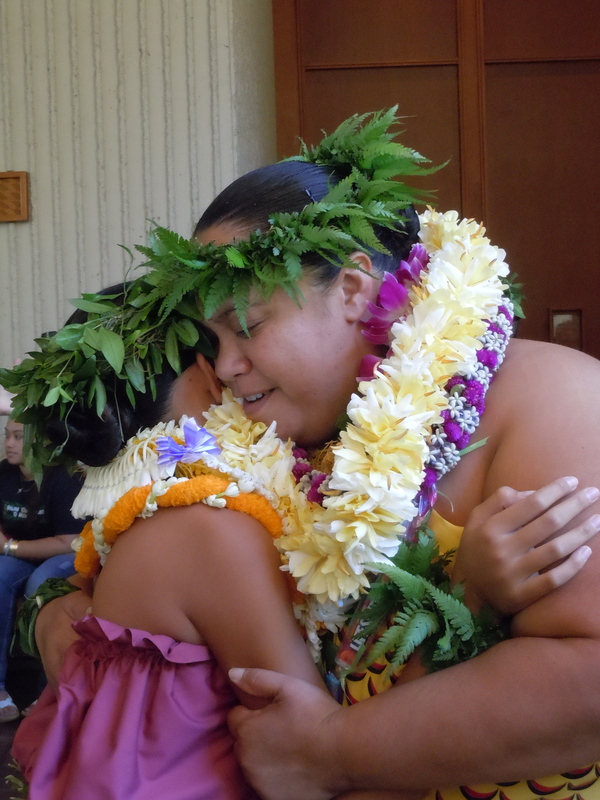 One of the participants who received a hug and a lei from one of the children. 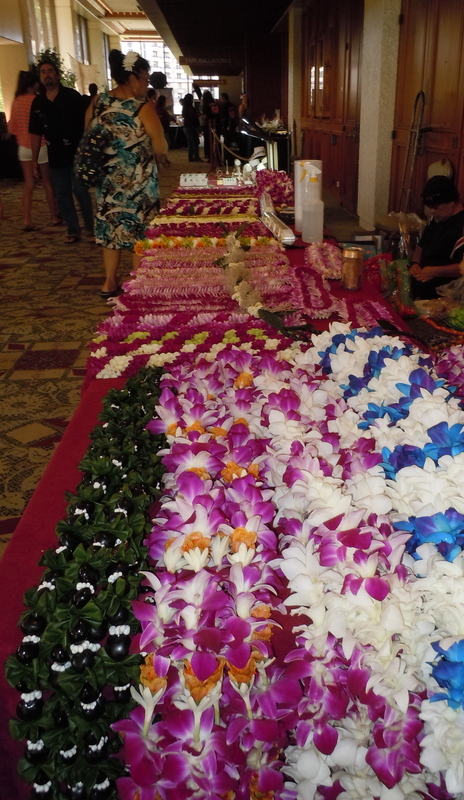 You can see many of the attendees already received a lei. 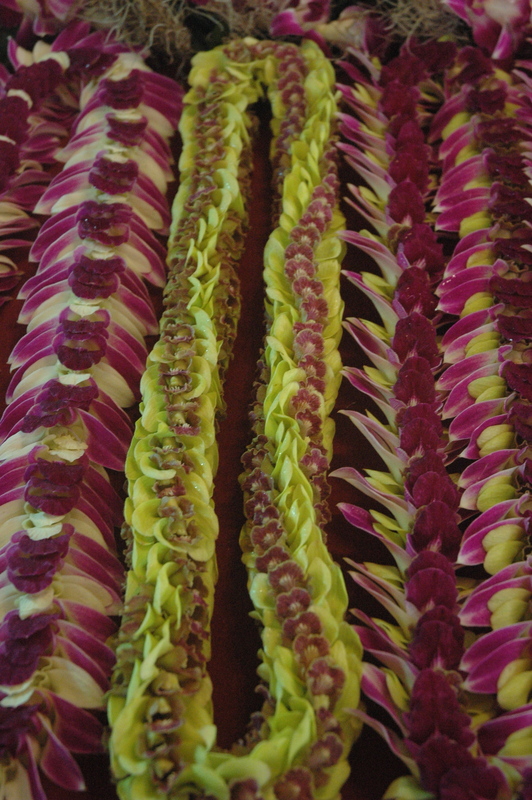 After the lei’s were handed out then everyone began to eat and many then went into the museum. Having forgotten my name tag I had to wear a kihe so that participants would know I was part of the staff who was giving tours. . What do you think? Do you think the could see me coming? 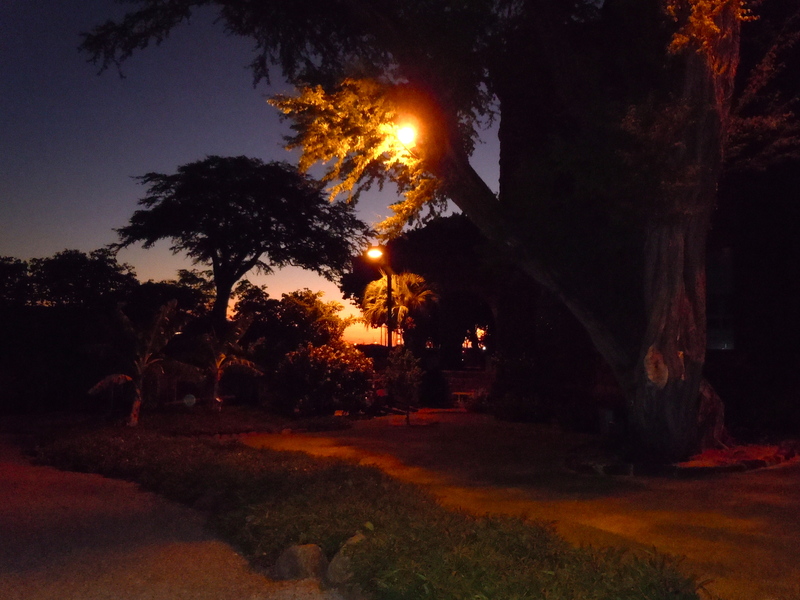 As the sun was setting the whole campus took on a different look from what we are used to seeing during the day. Of course I had y trusty camera in my pocket and so went off to try to get some photos on a wing and a prayer without a tripod. What a perfectly beautiful night it was. 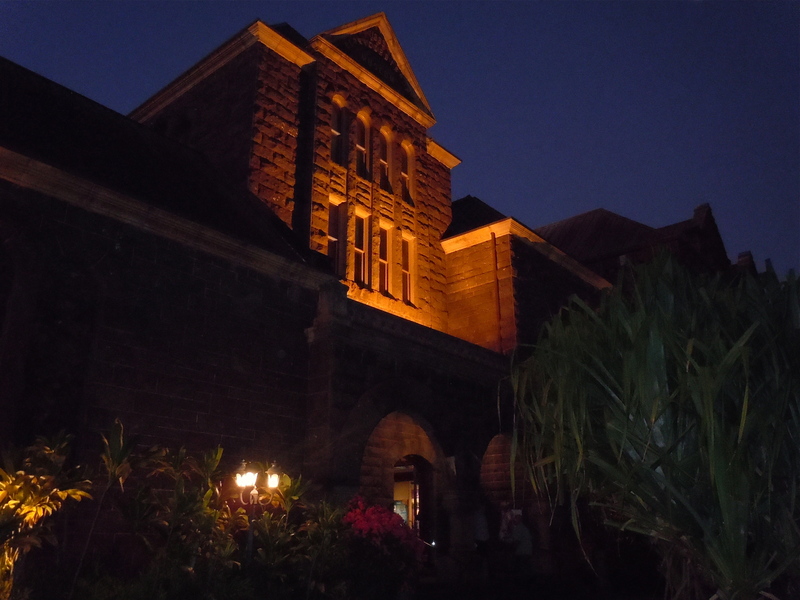 Bishop Museum was built on what was once Kamehameha school. 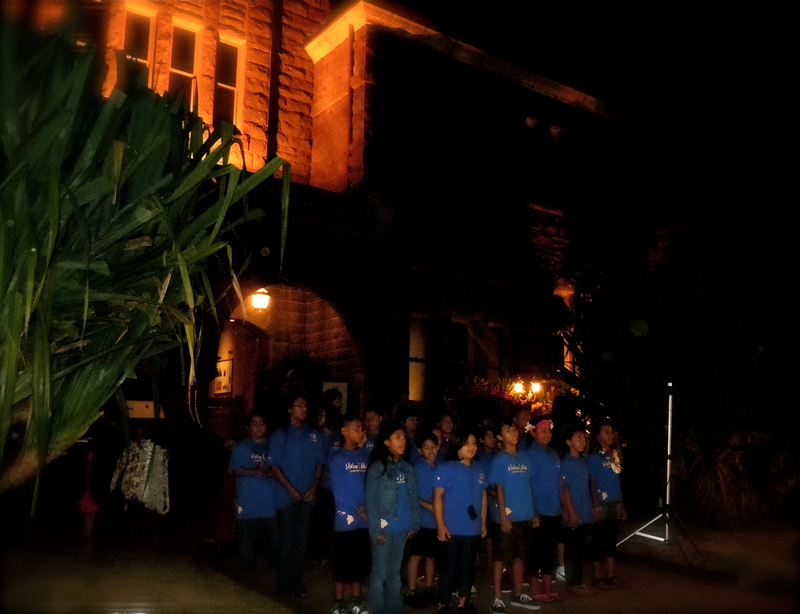 If you have not heard of this school it was built for children of Hawaiian decent. Bernice Pauahi Bishop who was the great-granddaughter of King Kamehameha left thousands of acres of land to be utilized to make money to build this school. It was her wishes stated in her will that a board of trustees be set up to manage the land. And manage this land they did. The school is a premium private school with anything and everything that a child would need to be educated. Anyway since the school was first built here the museum was built here too so that the children could come to the museum and see all of the things that had been created by their ancestors. That is why we still call the area the museum is on a campus. 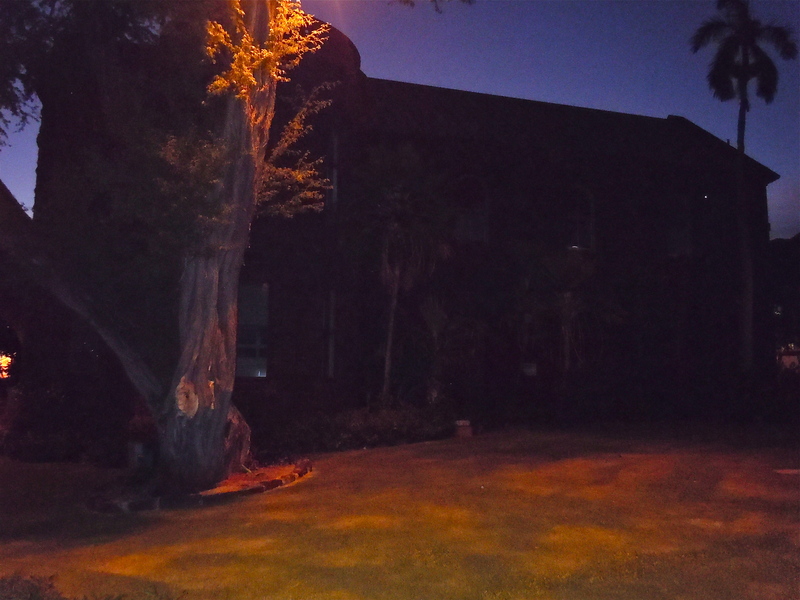 So as the sun sank slowly into the west and the lights shone through the trees, I made my way back to the museum where a wonderful night at the museum was had by all. 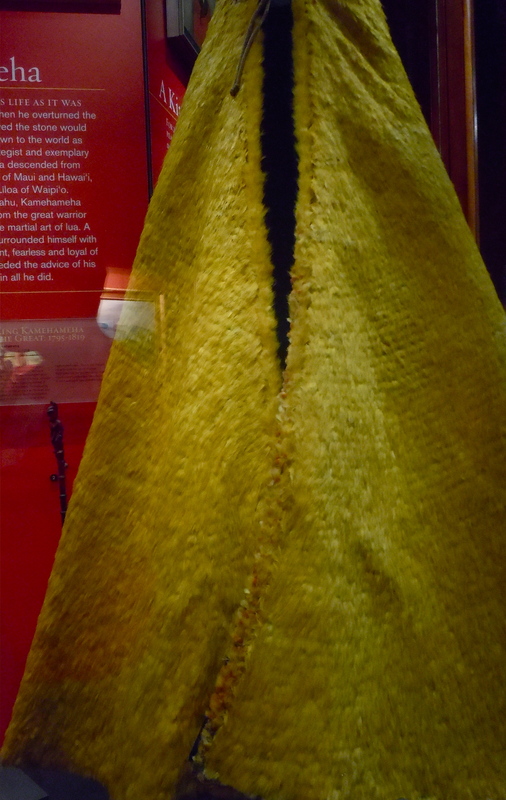 King Kamehameha’s feather cape. 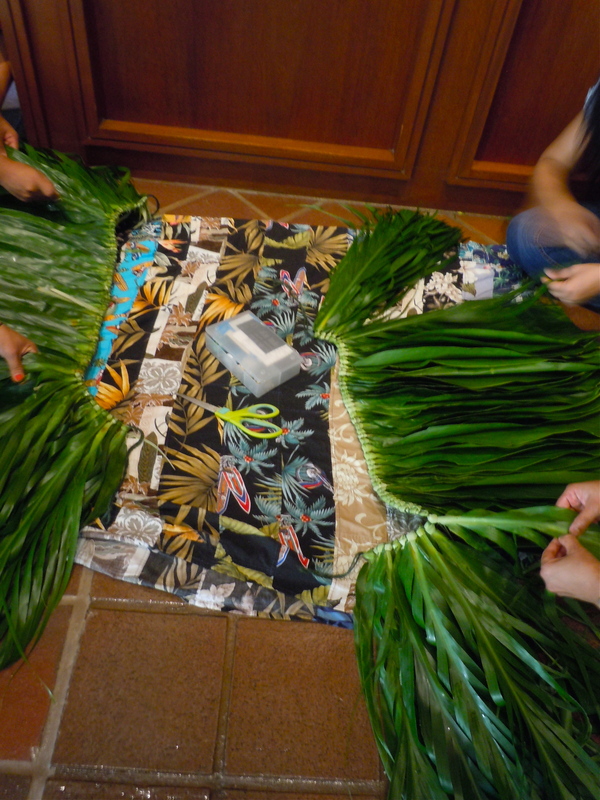 Mamo and ʻOʻo feathers. It was once calculated that there were over 450,000 feathers in the cape. 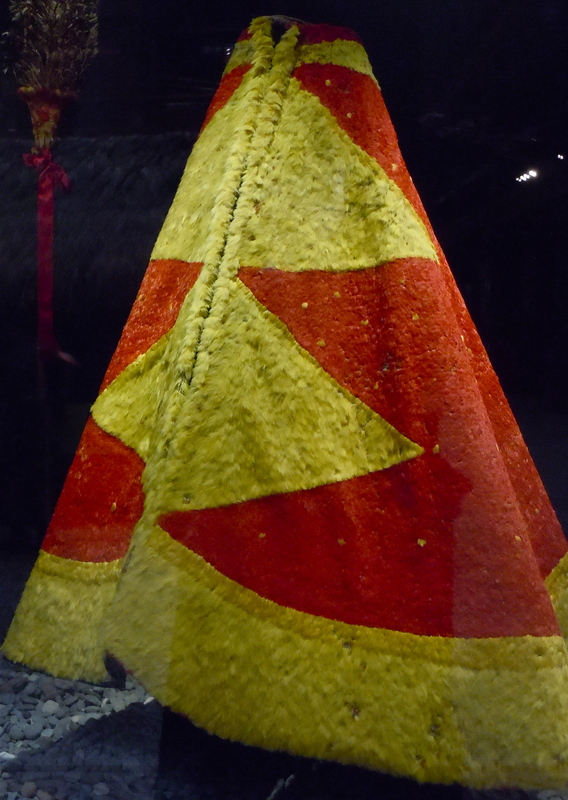 Kamehamehaʻs cape is a magnificent cape if not a magnificent piece of Art. The yellow of the feathers have a rich golden hue to them because of the fact that under the layer of yellow feathers is a complete layer of red feathers. You can just see the red feathers by double clicking on the photo and checking out the edge where the yellow feathers have come off. 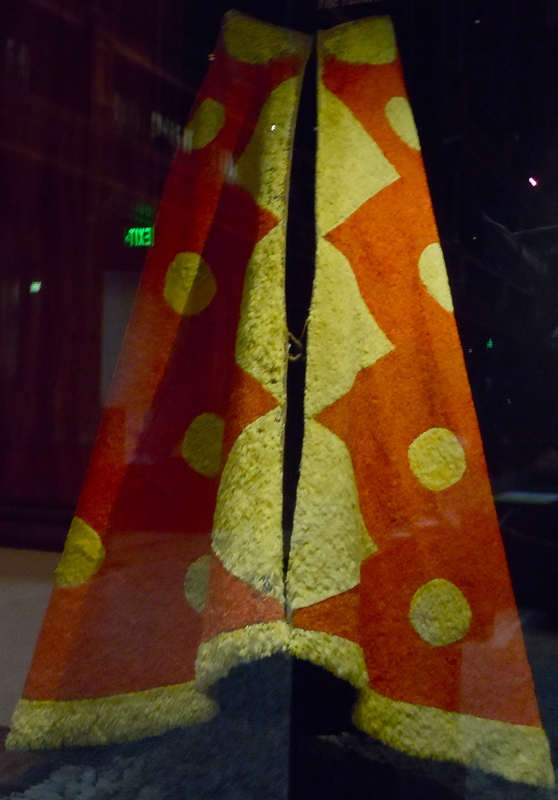 In the time of King Kamehameha these capes not only served as a sign of status they were also functional when going to war. In my mind’s eye it must have been a magnificent sight to see. Though these warriors were fierce and a force to be reckoned with you can almost imagine it like a parade. Though a very frightening one. In front of the army and near the King came the high priest carrying, elevated on a staff the war-god Ku-kaʻili-moku. This feathered god with pearl shell eyes and 94 dogs teeth in its mouth, it was said, would scream. The sound could be heard emanating from it during times of war. 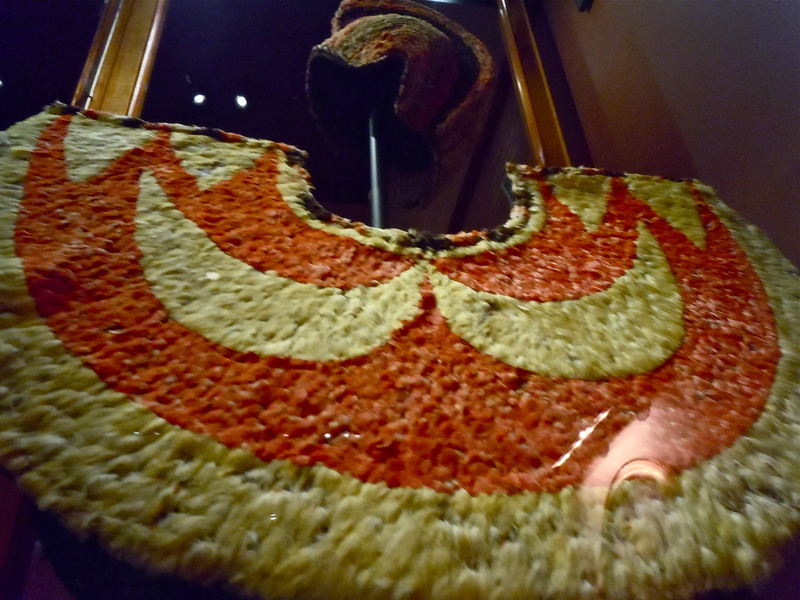 At one time the god or kiʻi had a crest of feathers that would bristle and point the way into battle. The standing feathers was considered a favorable sign. Next you could see the king heading up the front of the army with his long cape and a woven high crested helmet. The function of these capes besides their beauty and designation of social order was itʻs ability to serve as protection. I have read that with its folds it made it hard to tell where the chiefs vital organs were also it could help deflect the aimed spear. The front of the cape would be above the chiefs knees so as to enable him to maneuver better. 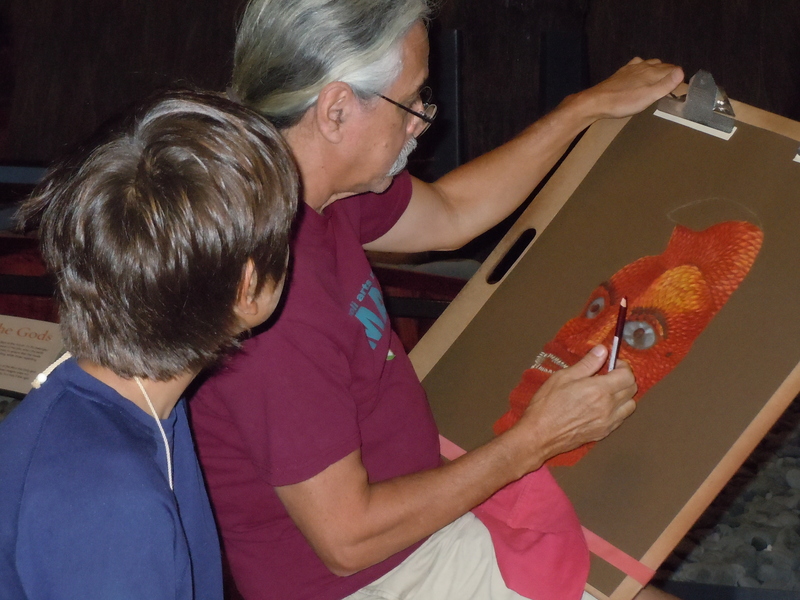 The red in the cape may have come from the ʻiʻiwe which supplied most of the red feathers. 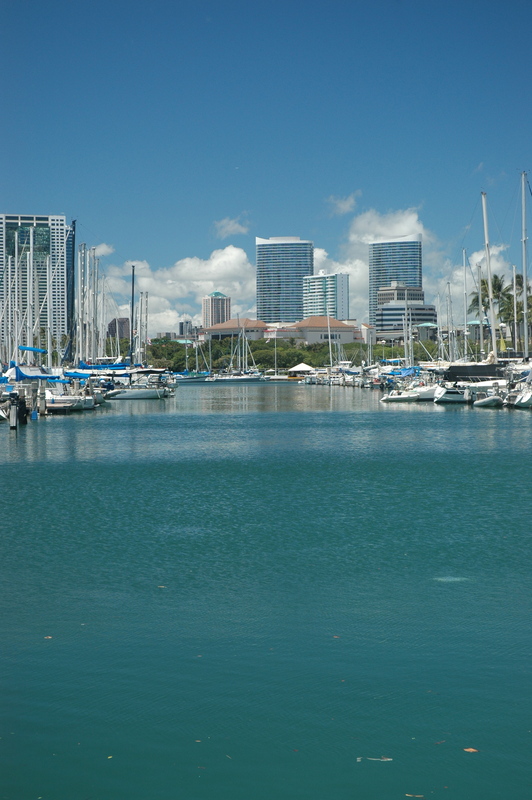 The yellow came from the ʻoʻo and the mamo. These two species had a small amount yellow feathers. Iʻve read between 5 and 7. The feathers were plucked when the bird was molting and the let go to grow more. 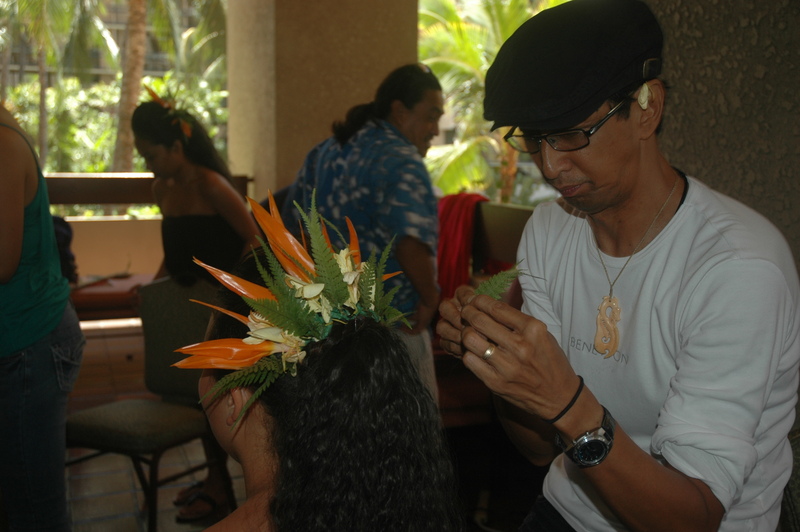 The feathered helmet called a mahiole. This is a low crested helmet. This would have been a full feathered helmet but has withered through time. 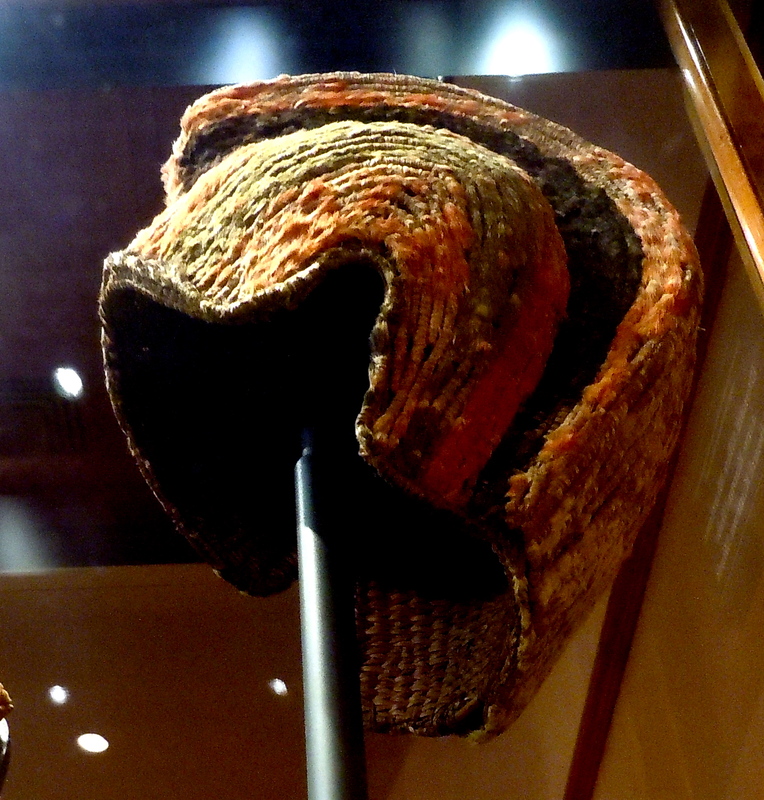 On the chiefʻs head would have been a woven, feathered covered high crested helmet that would have protected him from the slings of rocks that were part of the weapons of war. The lesser chiefs would follow the high chief surrounded by their own warriors. He would have worn a shoulder cape and usually did not wear a helmet. 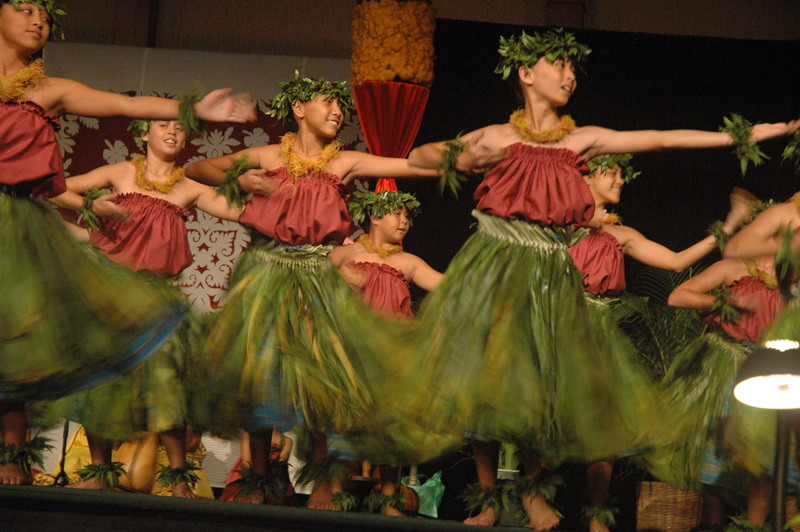 Then came the koa or soldiers who wore malos or loin cloth. Some wore nothing at all but rubbed themselves down with oil that might have come from the Kukui nut-tree. Chiefs had been known to go to war with their wives who would take up the fight if the husband was engaged or fallen in battle. 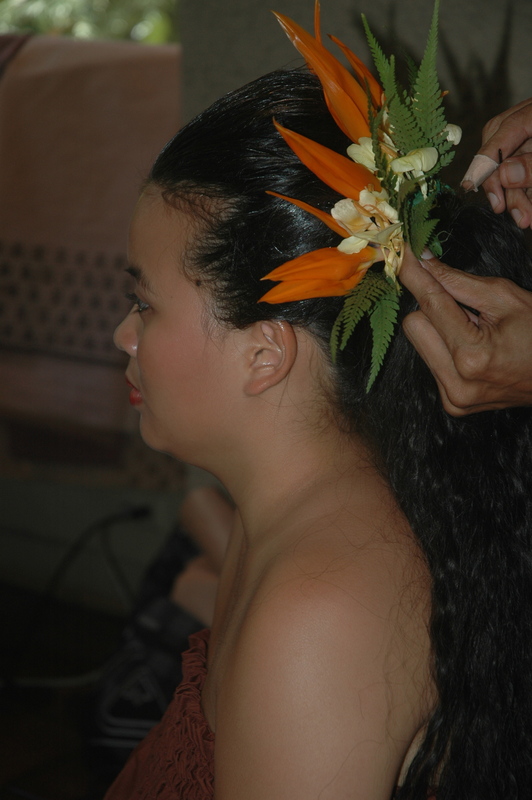 Women warriors were called Koa Wahine which meant brave women. The following are some of the weapons the warriors would have used. Bludgeon daggers. Some of these clubs had a dual purpose. 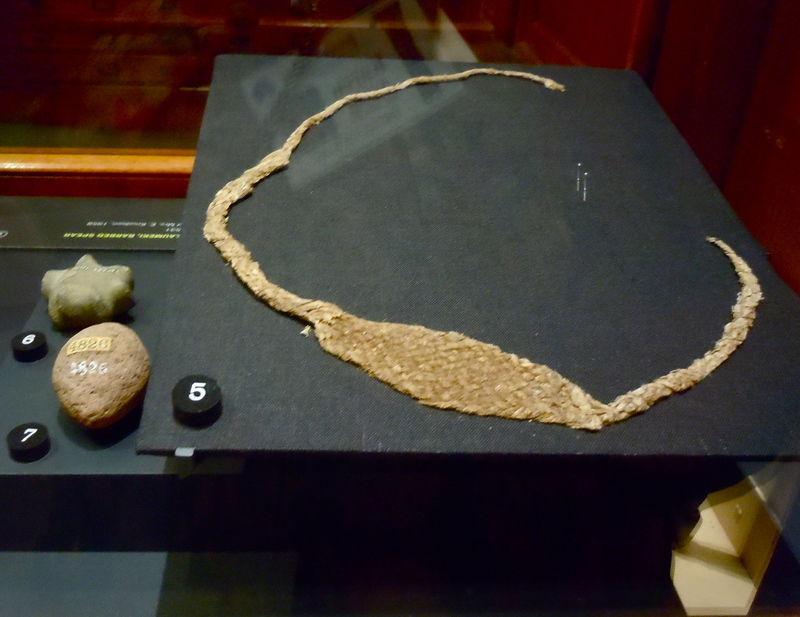 A cordage was place in the middle of the instrument and it could be manipulated to either be a club or a dagger. Some were just daggers and others were just clubs. 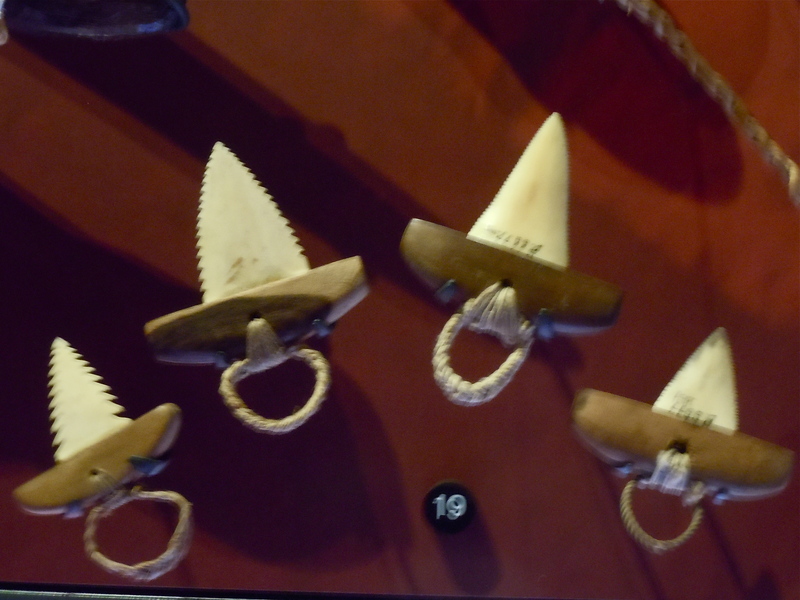 Shark tooth implements worn on the fingers. Gives a whole new meaning to brass knuckles. 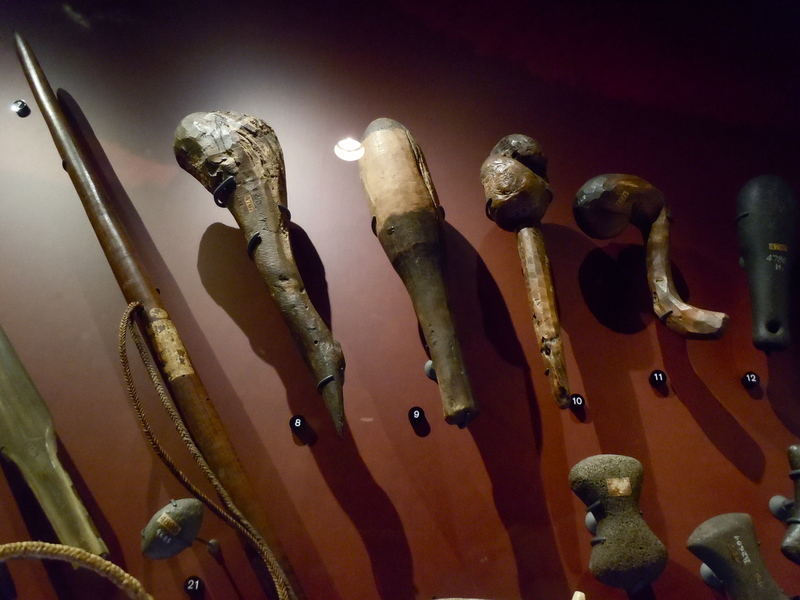 Spears made of a hard wood called Kauila. The long spears were pikes and the short ones were used as javelins. The beautiful sound of birds, the breathtaking sight of the black Mamo with itʻs scant yellow feathers, the rich texture of Kamehamehaʻs cape would be forgotten as the parade of feathers headed off to battle. Hmm. Beauty is as beauty does. 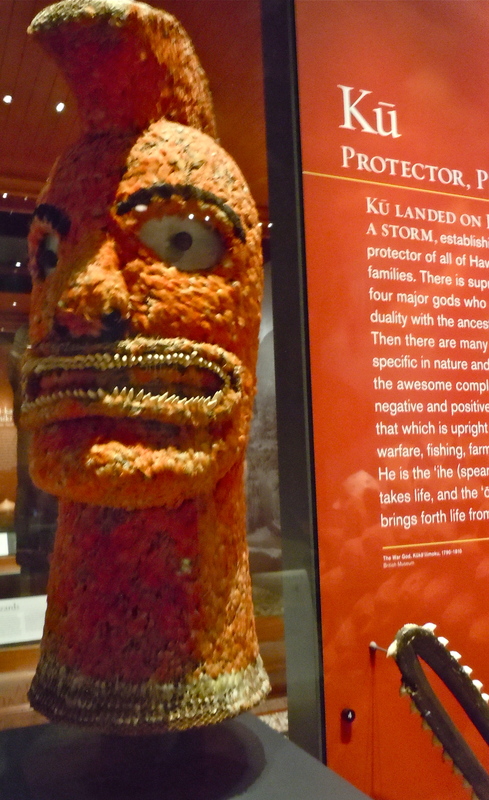 All of these artifacts can be seen at Bishop Museum. 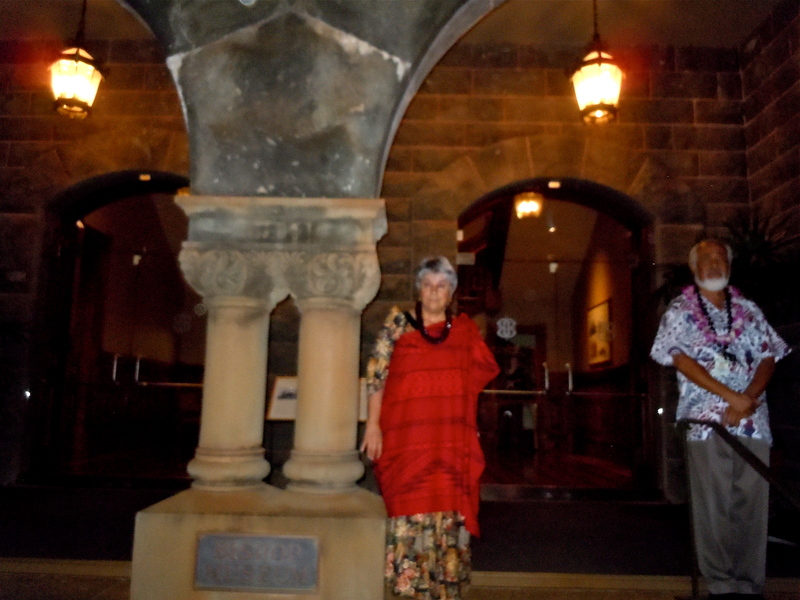 Well with the exception of King Kamehamehaʻs cape which will be on loan to Iolani Palace for a while. If you would like to read a very good book about how these artifacts are made and used check out the book, “Arts and Crafts of Hawaii” by Sir Peter H. Buck. A lot of the information that I use for my blog and tours comes from this book. 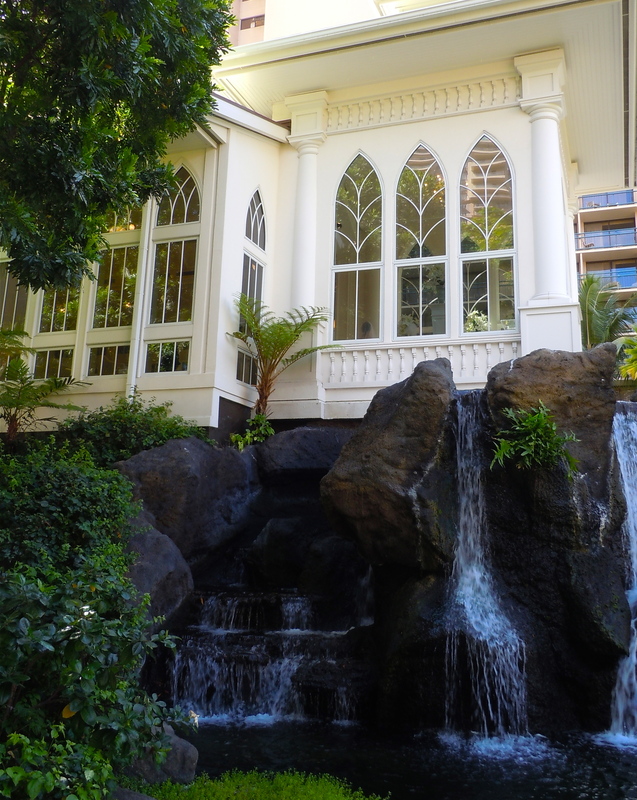 The work written here is that of Kareninhonolulu and not that of Bishop Museum. There were a lot of groups at the museum yesterday. Kids with wide-eyed wonder and lots of questions. We always prepare them before entering the hall that they must use their indoor voices etc. But once they enter the Hall all bets are off as they can’t just look. That is how I feel each time I go to the museum to do my tours. Only it is not so much looking at all of the artifacts but it’s just the surprises that can be encountered at any point of the day. While the restoration was going on in the main hall in 2009 there was always exciting events taking place. As we attended classes to prepare for the opening of the hall often we would walk over to it to check on the progress. 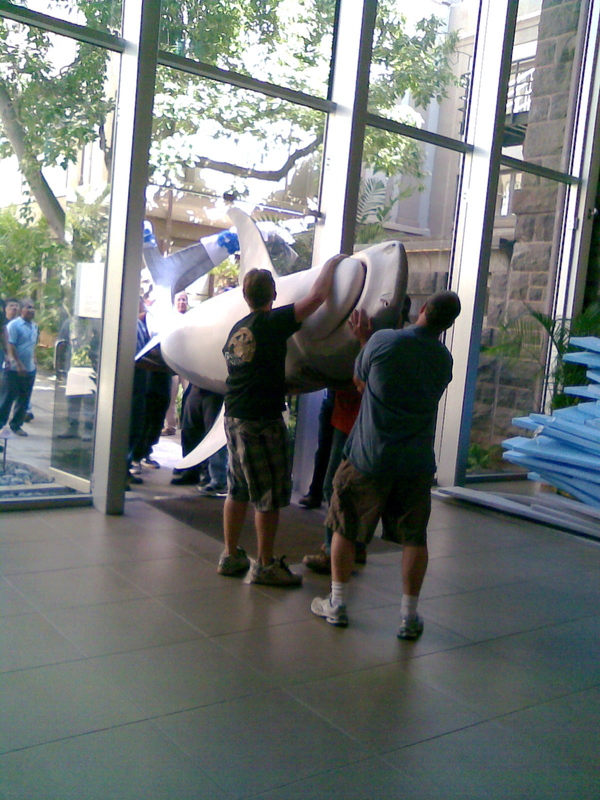 On one such trip I saw these poor guys struggling with this shark as they tried to figure out how to get him into the door. 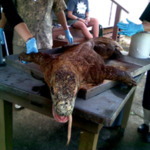 Then there was the day we were in a lecture and found out that they had just brought in a Komodo Dragon to be preserved. If we wanted to see it whole we would have to be quick. So off we went to view it up close. We were told that this dragon had liveed a long life and was ill and been humanely put down at the zoo. I also learned about how the saliva in the dragons mouth was very poisonous. This past Friday was uneventful other than the many, many children who were there for tours. An exhibit was being installed and I always enjoy watching that process and viewing the artifacts that will be out for a short time. But my foot was acting up again so I had to cut the day short. It was a couple of blocks away that I saw something I had not seen in many years in Hawaii. 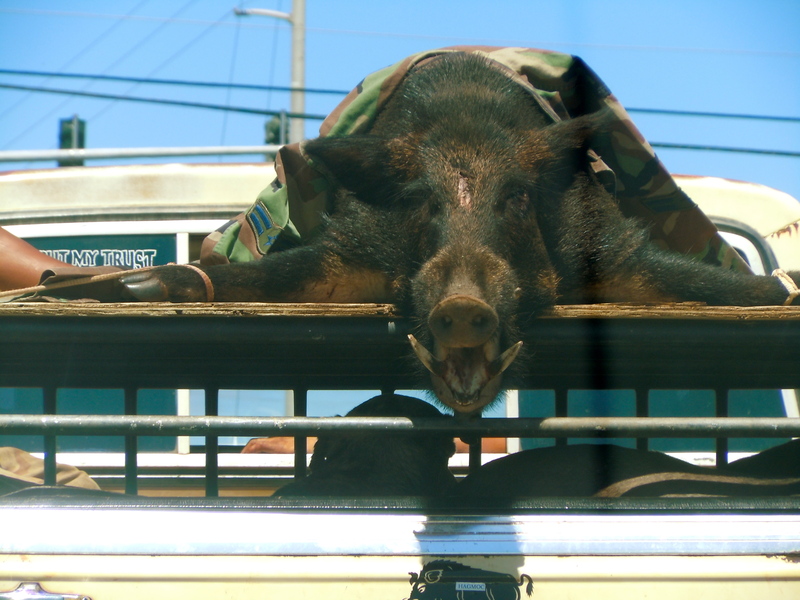 Pig hunting was a pastime that took place every weekend here in the islands. The hounds were loaded into the truck excitedly barking and tails wagging. Men with large knives and perhaps a rifle to insure that they would be safe would jump into the front of the truck and off they would go. I only know how the old-time hunters ran down and killed their prey. My brother-in-law had his pack of dogs and his huge knife. He and a few friends would head into the mountains and let the dogs pick up the trail. Once they found the pig they would corner it. Then my brother-in-law would go in with his knife and kill it instantly. The gun? Well he said it was only there in case one of the hunters or a dog was being attacked. He absolutely did not want to shoot the pig as he did not want to ruin the meat. So as I pulled up to the stop light just around the corner from the museum I saw this site. And of course I had my trusty camera. I whipped it out of my bag and took the photo from my car while we were stopped at the light. Just another day in Paradise. 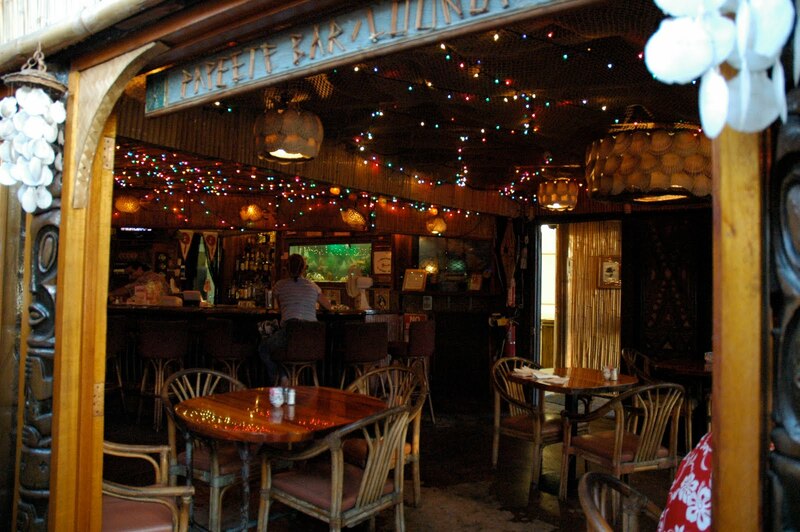 La Mariana Restaurant and Bar is a step back in time. So if you would like to shave a few years off your age and go back to the 40’s and 50’s here is the place to do it. I’m a creature of my environment. I love British Television because I like the cinematography that just grabs me by the collar and puts me right into the scenery. I like to be surrounded by all of my things so that I can look at them and think about all the good things in my life. Most of all I like to envelop myself in reds, peach and orange colors. So going to this restaurant and bar just makes me happy. 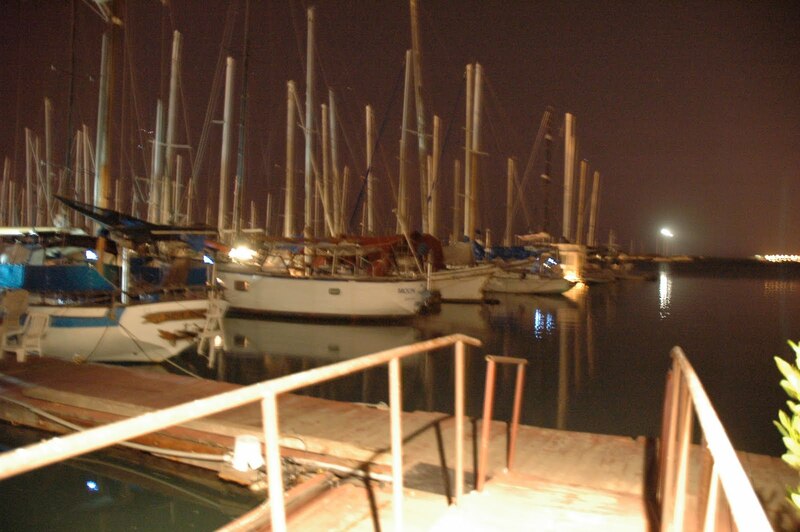 This is the La Marianna. 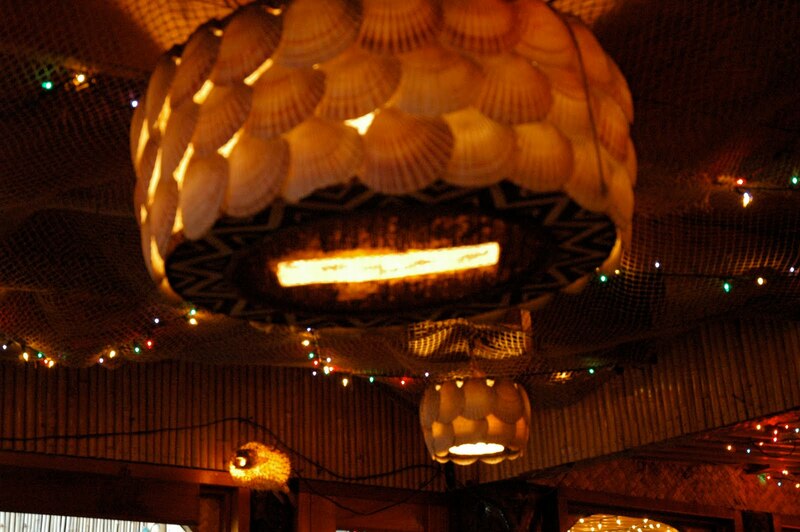 If you look closely (double-click on the photo to enlarge it)at the lights just above the patrons head you will see that they are actually blow fish that have been made into lanterns. The restaurant, for those who live here, is down Sand Island road and off to the right. You have to look carefully as the sign sits on a fence and is not that big. 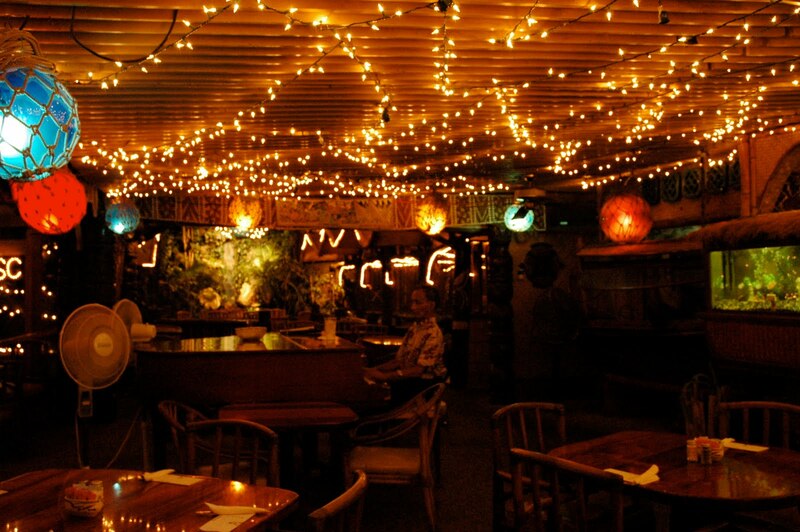 As you sit and have dinner you are entertained by a nice soft back ground of piano music. It doesn’t sound so loud that you can’t have a conversation but wafts pleasantly throughout the room. Like I said the atmosphere is what I’m here for and the fact that all of the artifacts that you see here were collected from famous places that closed here on the islands throughout the years. 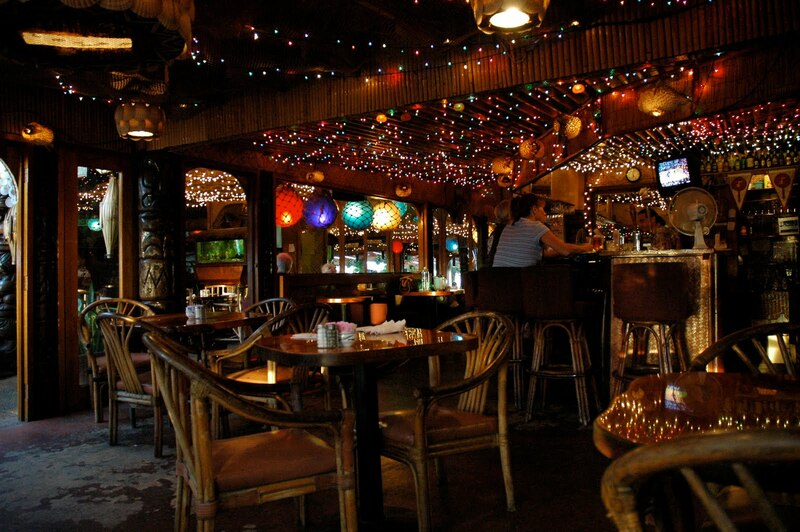 This is the last of old Hawaii and truly is a destination not to be missed. 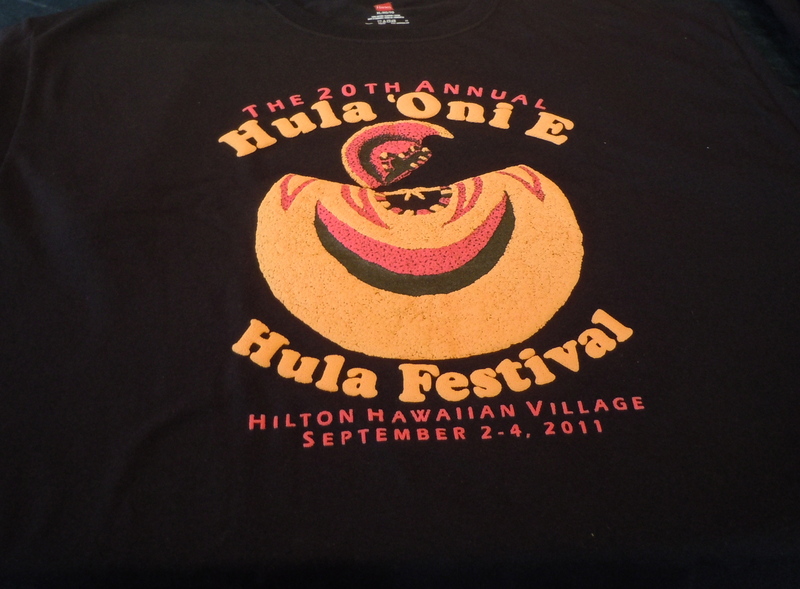 The food is so so but is made better just by being in the middle of all this Hawaiian history. A close up of a shell lantern and you can see the blow fish light in the background. If you happen to sit by certain open windows this would be your view at night. But watch it if you sit at the bar a little to long. It’s just as hard to drink and swim as it is to drink and drive. My son is trying to be patient with me as we head on to the hotel grounds. He is talking to me and walking ahead when he realizes that I’m still at the statue taking photos. 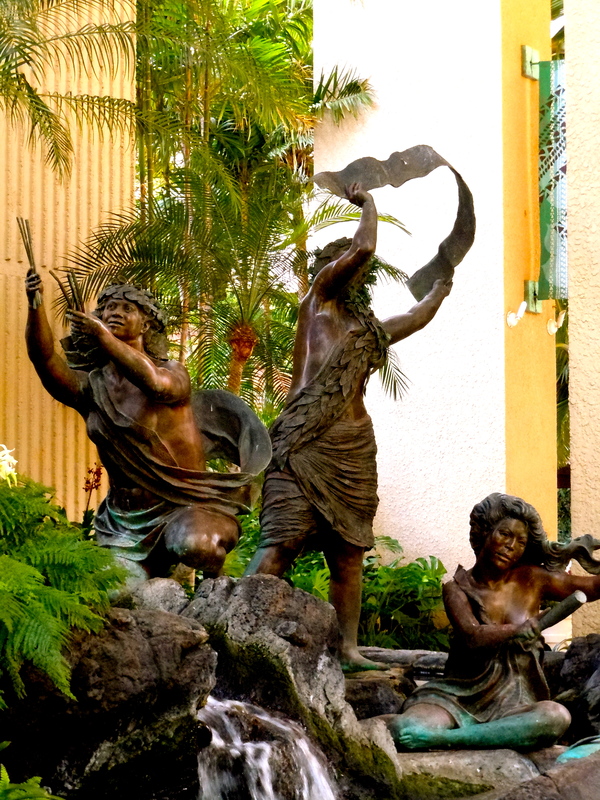 The sculptures are graceful, full of meaning and captivating. I need to take a picture. How else can I tell a story. This tells the story of the making of Kapa by two sister in an ancient legend. The seated woman who is pounding Kapa is Puanani Van Dorpe who has learned the ancient ways of Kapa Making and passed it on so that the art of Kapa won’t be lost. 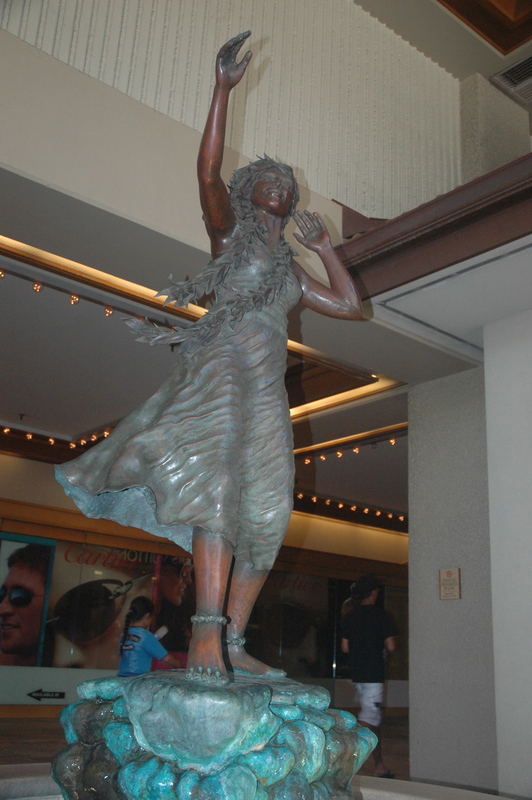 She has been named a Living Hawaiian Legend. So my son backs up and tells me it is OK he understands and once again we start for the festival. Then I see the chapel on the grounds and what’s that in the window? A bride. I must take a photo. The wedding chapel where a Japanese bride is waiting. Many Japanese come from Japan to get married here. They most likely will have had the traditional Japanese wedding at home but still pay big money to have an American wedding here. Usually it is just the bride in groom and no guest. 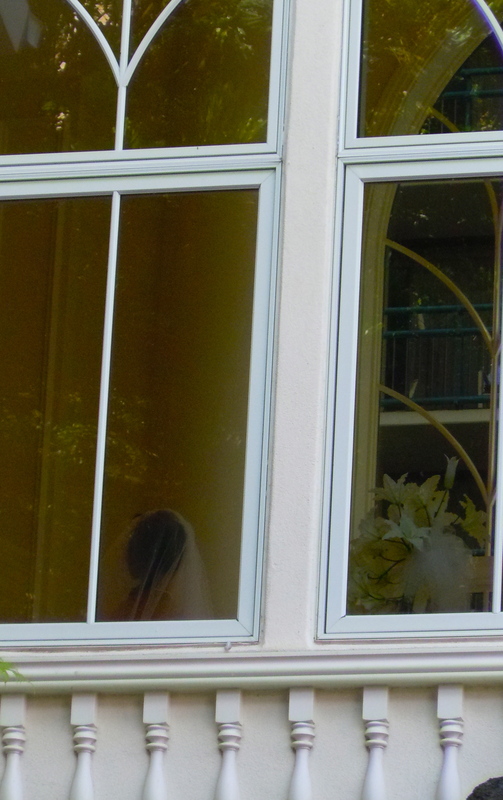 I’ve purposely left the photo large so that you can see the bride inside the window. My son now has told me that it is getting late and if we don’t hurry we won’t get a good seat. So I leave all the Kodak moments behind and we head into the hotel. As we step out of the elevator we step into the heart of the festival. By that I mean the preparation. I’m not sure why a lot of the work is going on in the hallways. Maybe the hotel did not provide the halaus with an area to prepare or the halaus just spilled out into the walkways. What ever the reason I find it thrilling and immediately start taking more photos. One of the males is being fitted for his skirt. My son has now managed to relate the urgency to me as I take my last photos. 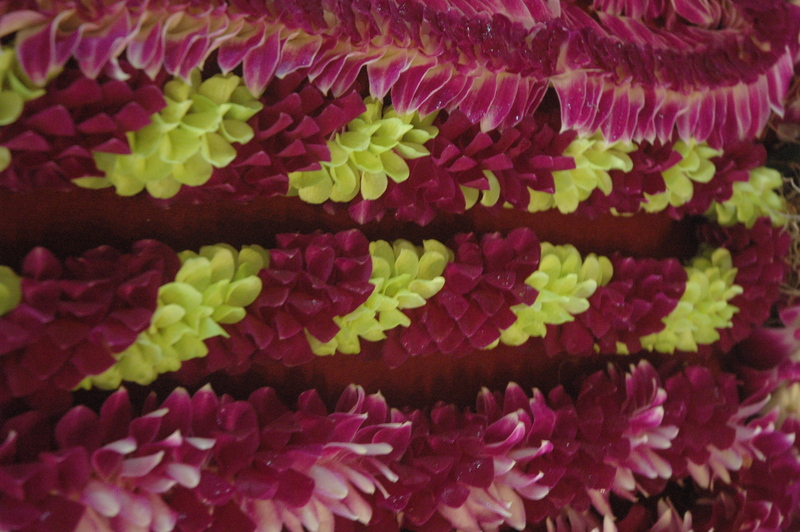 I just could not pass up these leis. 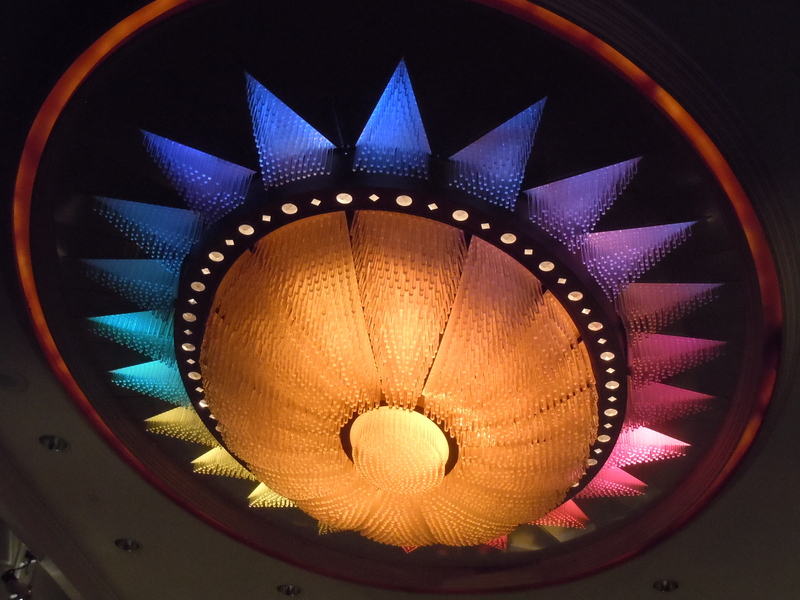 The fixture lights up signaling the beginning of the festival. Auana Hula (modern hula) This is what most people think of when they think of Hula. The graceful dancers whose hands seem to float tell a story about the snow. 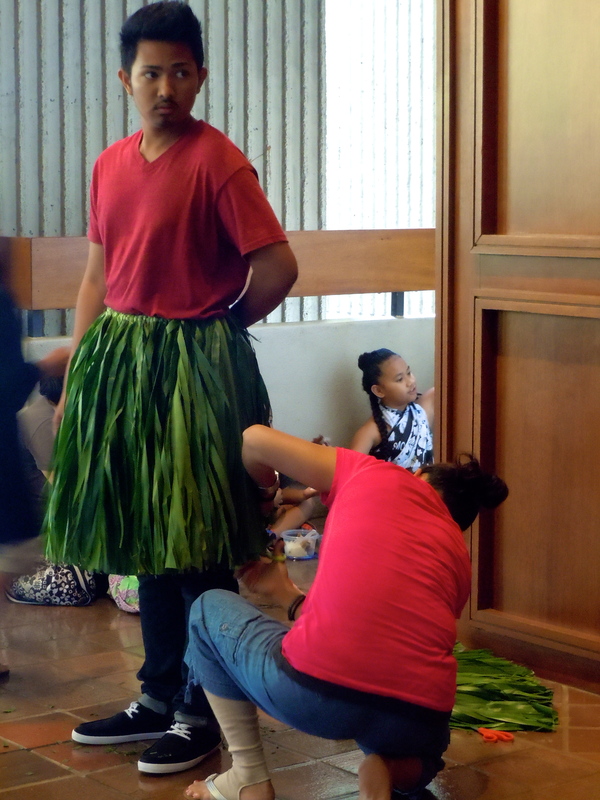 When the halau enters the stage the kumu calls to get ready. The excitement begins. The audience which by now is full of other halaus call out loudly and excitedly. This is a competition but everyone has worked hard, raised money, put much time and sweat into their routine and when a strong move is performed they are not competitors but co-hearts, all are one in the perpetuation of an ancient art that almost disappeared because of the outside influences to the islands. I can’t help but cry I am so emotional to watch my calabash granddaughter perform. 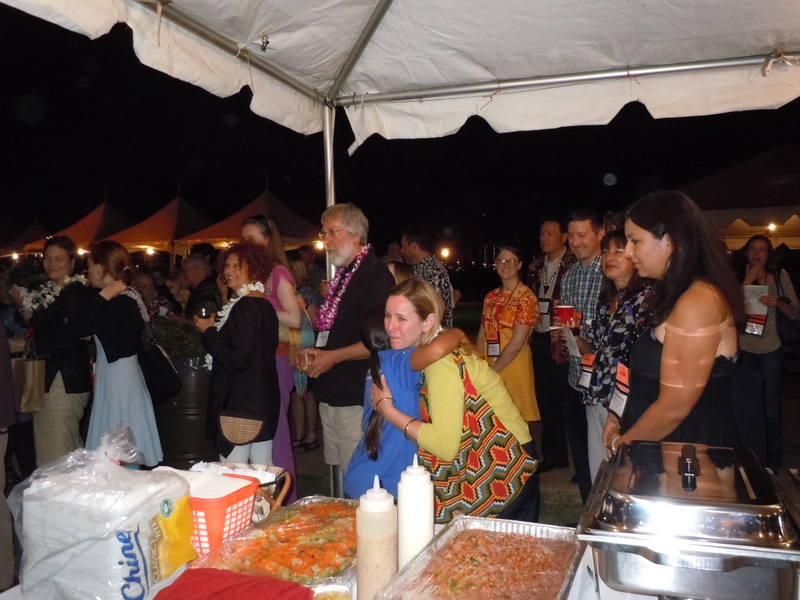 The performance is over and the kumu hugs one of her performers. Love and respect passes from the dancer to her teacher. 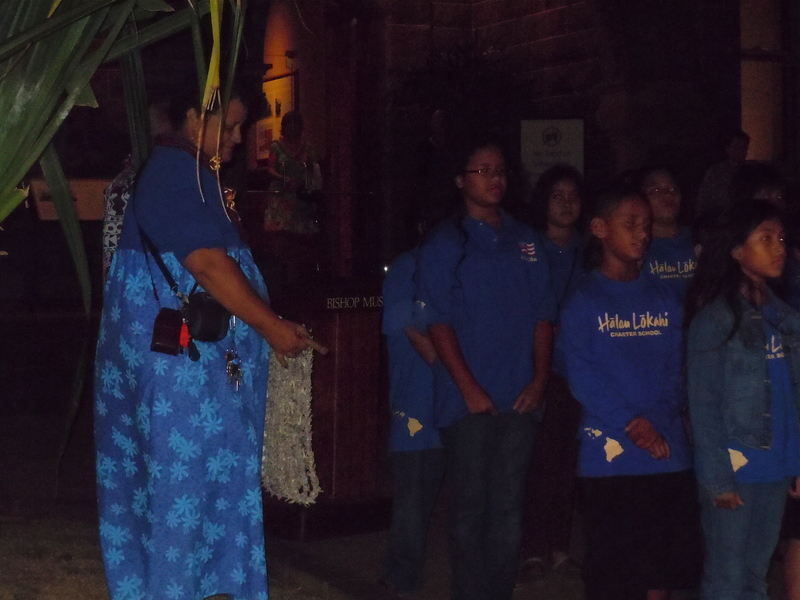 They’ve worked hard and the expression on the kumu’s face shows how much she cares for her girls. It’s over now. 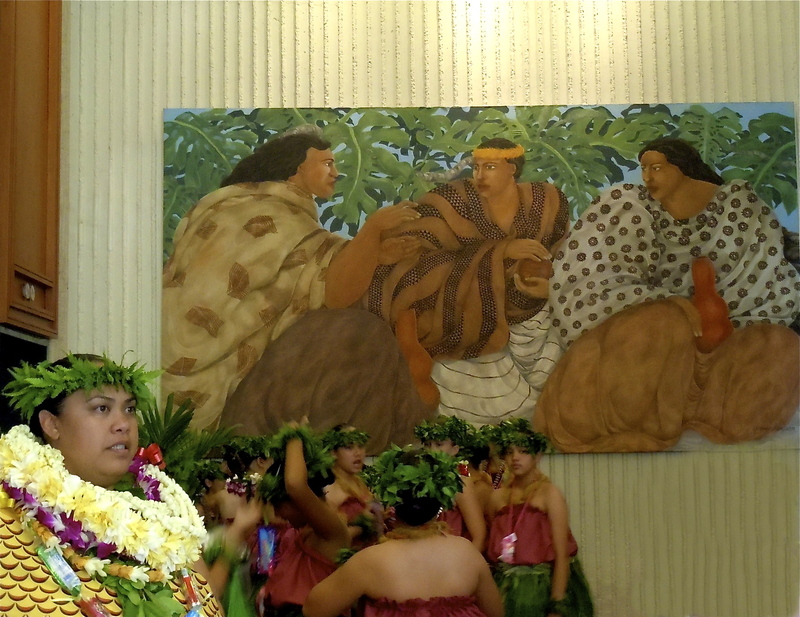 The Kumu calls her girls together and they wait for the elevator to head back to their rooms where they will change and come back to the auditorium to then cheer on the other halaus. My son and I head out of the hotel I with my camera in hand now that I am not on a time frame. But everything seems to pale after all the color and excitement. Then I see this one last sculpture. Happy faces and wonderfully behaved children visited the museum today. At least in this instance. 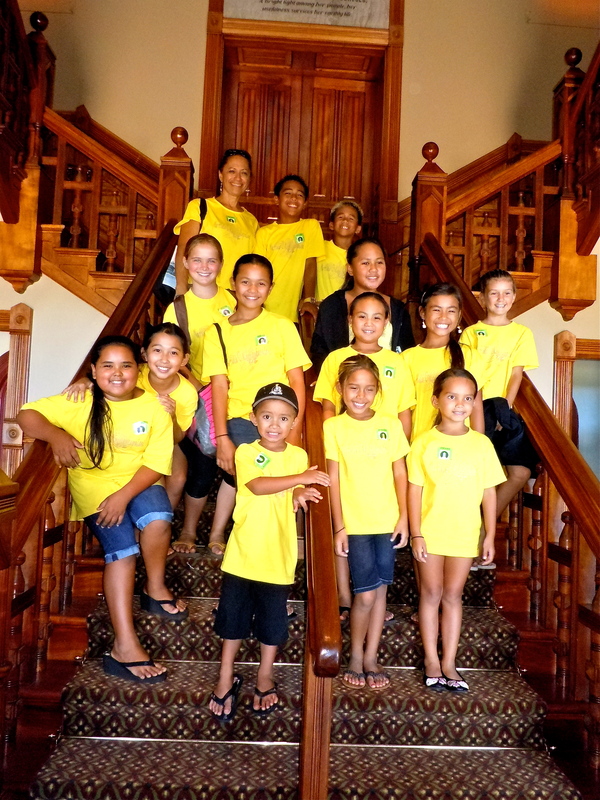 In the Kahili Room I met these children who are visiting from the island of Kauai to dance in a hula festival tomorrow at the Hilton Hawaiian Village. They were doing a self guided tour so I took the opportunity to tell them about the Little Prince, Albert and his Kahili. (See Prince Albert to read about him) They listened attentively and were a pleasure to talk to. This young man was very interested in the piece that David was working on. We all love it when he comes to the museum to work on the Ku. His work is stunning and amazingly life-like. He sits for hours and patiently works. He answers all the curious onlookers and even us docents who can’t help but look over his shoulder are tolerated. Then my teens showed up. They were a hard audience. Eighteen kids who were to have an hour tour. Great. That was what I liked because a 25 minute tour is never enough time to go through the three floors of exhibits. But from the get go half of them were going off on their own. They did not seem to care about anything I talked about. A few faithfully followed and asked questions. There was nothing I could do to keep the 18 to pay attention. I was taken back to my time in high school in my history class when my eyes would roll when we sat there listening to the teacher grinding out the facts. Seeing the boredom in these faces made me even more tongue-tied. By the time that we got up to the third floor I would say Three fourths of them were leaning over the railing, their teacher not seeming to even notice. So I just gave a private tour to maybe five kids out of the eighteen. But those five cared. They asked good questions and made intelligent comments. By the time I finished that tour, my throat hurt, my foot was aching and I just wanted to go home. I got home let out the dogs, quickly drove to the school and picked up Nico and thought to myself it is a three-day weekend, no more kids, questions or eyes rolling. As Nico got into the car we drove off to the bank he started; Grandma why can’t we just walk in the front of people and quickly get out of here? Then at Fed Ex, Grandma, why are you sending that box to someone? What happened to the printer, how do you know it’s broken? And so into the evening it went. But now I sit here by myself, Nico’s gone off to his other grandma’s house, Chris is out shopping and I’m surrounded by the three dogs. Life was good today and it is right now. Maybe I’ll go and get me something to eat. Not having to cook? The best pleasure of all.